A huge thank you to Bob, Diane and Ernie. Your thoughtful and generous giving is very much appreciated by all of the family. 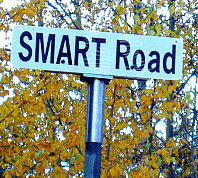 Both Dad and Mom Smart would have been so pleased with the sign. Thank-you all so very much.